Are you going to Experimental Biology? See you there! If you’re in San Diego for the 2012 Experimental Biology conference, make sure you drop by Booth #416. We will be showcasing our journals and books and we will be giving away FREE copies of our ‘hot off the press’ new booklet containing a collection of our best biological chemistry articles! But why is the 2012 Experimental Biology conference important to a publisher historically renowned for high quality chemistry research? In response to the needs of the increasingly interdisciplinary community our activities have evolved over recent years. Our new and more established journals and books cover many of the most important areas of biological chemistry research. Lab on a Chip, Integrative Biology, Metallomics, Molecular BioSystems, Food & Function and Photochemical & Photobiological Sciences. Book series include the RSC Drug Discovery Series, RSC Biomolecular Sciences Series and the RSC Issues in Toxicology Series. 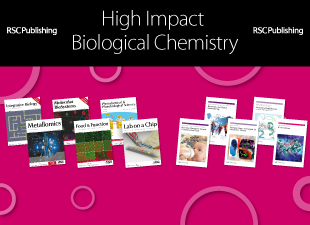 So whether you’re looking for the latest cutting-edge research, needing to access top quality reference works, or finding the best place to publish your biological chemistry research, choose RSC Publishing. After a successful introduction in 2010, the International Symposia on Advancing the Chemical Sciences (ISACS) is set to return in 2011. Continuing its support of the RSC flagship journal Chemical Science, this significant new global symposia series is ambitious in its scale and coverage. The second three symposia, like ISACS 1-3, will be held on three continents, over three separate weeks and have already attracted support from some of the leading names in the chemical sciences. Professor Tianquan Lian, from Emory University, Atlanta, said about the ISACS2 meeting: “The scientific content of the conference was of the highest quality and the hospitality was just superb. I have already told my colleagues about this wonderful conference and the new journal”. Each ISACS event will feature a single stream of plenary lectures complemented by oral presentations and extensive poster sessions with plenty of time dedicated to networking. The chance for young researchers to present their work alongside some of the leading and emerging names in the field is an opportunity not to be missed. Sign up for news updates and find out more at www.rsc.org/isacs. You are currently browsing the archives for the MBS category.